The first major European clay court tournament of the season has arrived, as the WTA tour heads to Germany for the Porsche Tennis Grand Prix. The Porsche Tennis Grand Prix debuted on tour in 1978, and has the distinction of being the only indoor clay court tournament on the tour, and the longest running indoor tournament on the calendar. The event was originally staged on a hard court, but in 2009 moved to the red clay. The clay used for this event is the same that is used at the French Open making it the ideal preparation for Roland Garros. The defending champion is Maria Sharapova, who has won this event for the past three years. The record holder is Martina Navratilova with six singles titles, and eight doubles titles. Other notable winners are: Justin Henin, Martina Hingis, Kim Clijsters, and Tracy Austin. All the top players minus Serena Williams are here, making this one of the strongest fields on tour. This match is undoubtedly the highest profile round one match-up in the draw, with the world number 10 facing the world number 11. To put it into context, Suarez Navarro is the eighth seed and if any seeded players pulled out, Petkovic would have been the next seeded player. The pair met in Miami a few weeks ago, and it was the Spaniard that came out on top 6-3, 6-3. That nudged the head to head 3-2 in favour of the world number 10, so as you can tell it’s really a toss-up. The pair have never met on clay, so if you want another reason as to why this is such a hard match to predict, there you go. Petkovic has had the more clay practice heading into the match, having played in Charleston and the Fed Cup so the German will have that advantage. The winner of this match will likely be top 10 next week, so the stakes are more than just a 2nd round spot. Be sure to tune into this one. There are a few reasons as to why this is an interesting match, not least of which is that Garcia has beaten Ivanovic in their previous two meetings. Since her last victory over the 5th seed in Indian Wells, Garcia has struggled, losing five out of six matches since. Ivanovic hasn’t fared much better herself in that time period, making this a must win match for both players. Ivanovic’s sole win over the Frenchwoman came on clay at last year’s French Open, and despite the consecutive losses to Garcia, the Serb will be the favourite to win this match. However, as recent meetings suggest an upset is highly possible. Radwanska vs Errani is perhaps the second most high profile match of the tournament with the world number nine taking on the world number 15. Errani’s credentials on clay speak for themselves, as the Italian is a former French Open finalist, and has won multiple titles on this surface. The bad news for the Italian is that she’s facing Agnieszka Radwanska who holds a 7-2 head to head leader over her. That includes a 3-2 head to head lead on Errani’s best surface, making this a difficult match for the 27 year old. Errani has always proved difficult to beat on the clay however, and with Radwanska not looking her best this season, this will likely be a close and long encounter. The big name in this half of the draw is of course, the three time defending champion Maria Sharapova. The Russian has dominated this event for the past few years, and with Serena Williams not in the draw, the world number two is the clear favourite for the title. Sharapova receives a first round bye due to her seeding position, meaning her tournament will start in round two and a possible match against home favourite Angelique Kerber. The German will be relishing the opportunity to compete in front of her compatriots, and should have the crowd on her side. Sharapova leads their head to head 4-2, with the clay record 2-0 in favour of the world number two. With her record on clay over the past few years, Sharapova has established herself as the Queen of clay, so she should pass the Kerber test. The second test will likely come in the form of Ekaterina Makarova. The sixth seed has cemented her status as a top 10 player with some impressive results so far in 2015. The Russian should get past the qualifiers that await her in round one and round two to set up the clash of the Russian blondes. Unfortunately for Makarova, Sharapova has owned her thus far in their careers including a straight sets win at the Australian Open this year. Anything but a Sharapova victory in this section will be a surprise providing her injury holds up. With Maria Sharapova a fair lock for the semi-finals, the second quarter will decide the world number two’s opponent in the final four. Petra Kvitova is the projected opponent, but if it was only that simple! Former French open champion Svetlana Kuznetsova is a potential second round opponent for the Czech. The Russian claimed her second grand slam title 6 years ago at Roland Garros, so you know she can certainly play on clay. Whilst on the subject of the French Open, Kuznetsova sent Kvitova packing at the French Open last year, winning 9-7 in the third set. Expect a tough match for Petra yet again in Stuttgart. Fifth seed Ana Ivanovic will be looking to find her feet during the clay court season after a disappointing run of form recently. Her first round opponent is Caroline Garcia, who has beaten her twice in recent months. 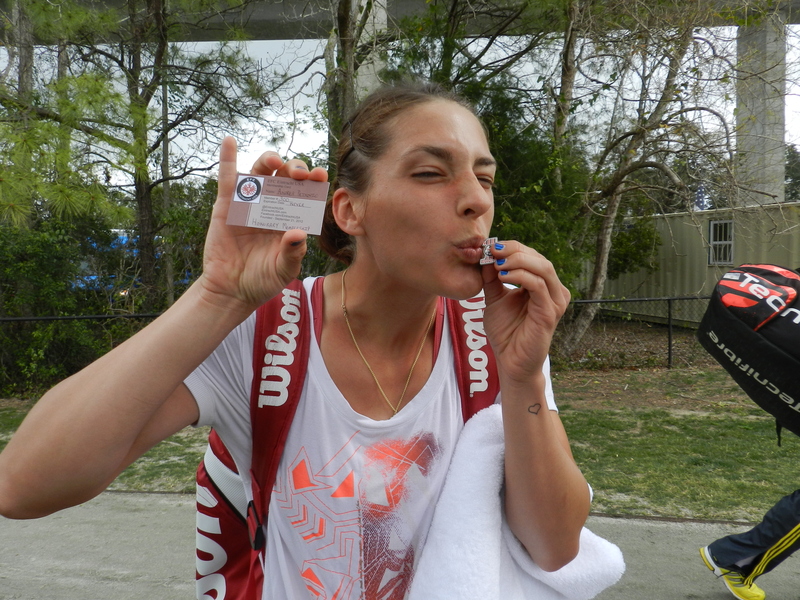 Ivanovic holds the advantage on clay I feel, so with that in mind the Serb should defeat Garcia on this occasion. Round three will offer a potential banana skin in the form of Mona Barthel. The German hasn’t been able to reach her potential as of yet, but she’s still capable of big performances to beat the top players. Unfortunately for Barthel (and the crowd) I see Ivanovic making the quarter finals here. The bottom half of the draw seems to bring more direct entries to the table. Whilst the top half is littered with qualifiers, this half has only one, arguably making It a more competitive section of the draw. It’s bottom quarter features Simona Halep, who has picked up form since losing in the Fed Cup to her potential second round opponent Garbine Muguruza. The Spaniard must first overcome the tricky proposition of Barbora Zahalova Strycova, but providing she brings some of her best tennis, Muguruza should pass that test. Garbine has defeat Halep in their only two meetings thus far, but recently the 21 year old has been in poor form. Expect Halep to extract revenge this time around. Sabine Lisicki must feel like the odd one out between the four that will fight for a quarter final spot against Halep. The powerful German is surrounded by consistent baseliners Aga Radwanska, Sara Errani and her first round opponent Zarina Diyas. After a disappointing weekend in the Fed Cup, will losing match point in her first rubber play on the mind of Lisicki? Despite Lisicki owning Errani, I believe that the winner of the Radwanska-Errani clash will make the quarter finals, before losing to Halep. Caroline Wozniacki has been a busy girl recently with her off court activities, but she has also made a change that could have big effects on the court. The Dane recently employed Arantxa Sanchez Vicario as a coach in hope that the Spaniard can push her towards a maiden Grand Slam. It is too soon to see what sort of impact Sanchez Vicario will have, but that doesn’t make Wozniacki’s second round match against Lucie Safarova any less exciting. Safarova has won their only clay meeting here, but that was five years ago. Given that the head to head is tied at 3-3, this one is hard to predict, but my gut is saying Wozniacki on this occasion. Carla Suarez Navarro will be relishing getting her feet dirty during the clay season after a good hard court swing that saw her reach the top 10. Fighting for the honour of being called a top 10 player will be the Spaniard’s first round opponent, Andrea Petkovic. The German struggled against Navarro in Miami, losing in straight sets, but with more clay court practice and the home crowd behind her, Petkovic may fancy her chances this time around. On the German note, Julia Goerges has received a wildcard into the tournament, and will face talented youngster Belinda Bencic in the first round. Goerges will be looking to set up an all-German clash in the second round, but the Swiss has picked up her form since their Australian Open meeting. Wozniacki vs Petkovic is the predicted quarter final, and with the German crowd behind her, we will witness the Petkovic dance (or it’s late version thereof) at least three times this week. I was tempted to put Maria Sharapova as the winner given her record in Stuttgart, but with the leg injury there is a lingering doubt. The next safest bet is Simona Halep, and that’s what I have gone for.